Craft brews and fur babies—it's a match made in heaven. Or actually, a match made at the Utah Beer Festival in 2014, thanks to the Humane Society of Utah. 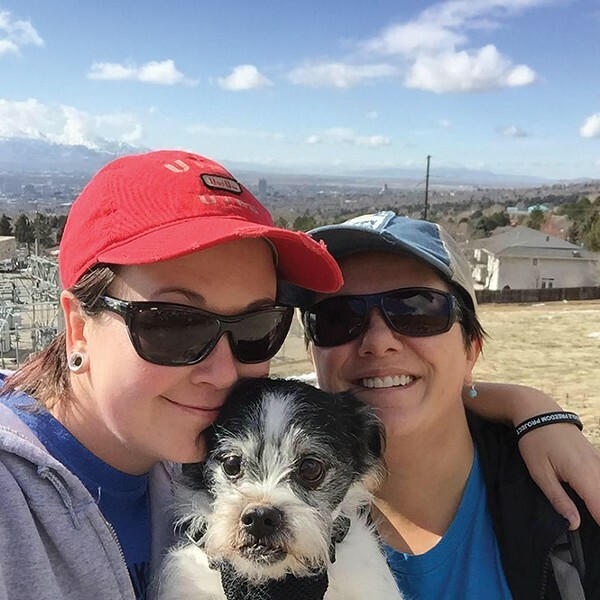 When HSU's Director of Development Jamie Usry (pictured above, left, alongside wife Dijana Ukmar and dog Monty) tasked her volunteer coordinator with recruiting 350 volunteers that year, she was met with a look of terror. That number has since jumped to 1,000. "Salt Lake City just keeps giving," Usry says. How did you first get involved with the Humane Society of Utah? I started as the volunteer coordinator nearly seven years ago. I quickly moved into fundraising at the HSU and became the development director to pursue fundraising, events, partnerships and community opportunities to benefit the shelter. ... I came to the HSU because of my love of animals. Our development, special events and volunteer team loves the opportunity to hold such a huge fundraiser with City Weekly every year. Well, of course, the animals. We are here because we are passionate about the furry creatures that make our lives complete. But a close second is the people. People that love animals and are willing to give their time without any compensation, without any reason but to give back and save lives. And people that will give their money to keep our programs running. As a charity, donated time and donated money are what keep our doors open. Why is it so important to team up on community events like this? Fundraising is the key element of events like the Beer Festival—50 percent of the HSU's revenue is through fundraising, sponsorships and events. We can't save lives without community events like this. Additionally, the people that support us through volunteering and those who attend the festival are all potential adopters and donors in the future for us. It's all about community and partnerships for nonprofits like us, and we are proud to receive so much support from an amazing local company like City Weekly. Going into your fourth year of working at Beer Fest, what would you say has been the best part of the experience for volunteers? Volunteers have told us year after year that knowing their hard work is saving animals in need is incredibly important to them. Even the volunteers that signed up for the festival because of their love of beer end up leaving feeling like they did something good for our furry friends. Any crazy stories you have from past festivals? Probably not something you want to use, but one time a lady stole an HSU employee badge and then pretended to be our marketing director. She was kicked out because she was so drunk. It was weird. Proper Brewing Co.'s Patersbier. New Utah breweries are awesome and this one was a great addition to SLC. Have you guys ever had anyone drunkenly adopt a pet and then change their mind later? We have an amazing adoption rate at Beer Fest, and in the three years we've done only a few returns the following week (which happens from shelter/event adoptions all the time; people get the pet home and decide it's just not the right fit). I was actually so excited to do the Beer Fest adoption follow-up story [for the Beer Issue on Aug. 10] because I got to reach out to a couple dozen adopters from past Beer Fests, and all of them still have the dog!